The last decade has been an eventful one for Iceland. That’s to say the least. The global financial crisis of 2008 eviscerated the country’s economy, sparking a systemic banking collapse more severe than anywhere else in the world. The collapse prompted the United Kingdom to respond by effectively ostracising Iceland from NATO — invoking provisions in anti-terrorism legislation in order to freeze Icelandic financial holdings in Britain — and barely a year later, in fits and starts throughout the spring, the eruption of Eyjafjallajökull cut Iceland off from the rest of the world. The recession that was triggered by the banking collapse didn’t abate until at least a year after the volcano quietened down, sometime in 2011, and the austerity measures demanded by the IMF in exchange for a bailout weren’t lifted until the beginning of 2017. One of the long-term cultural effects of these events has been a depreciation in the value of the króna. In the short term, this created conditions favourable to visitors from abroad, opening up Iceland to an influx of international tourists, and in turn, over time, it enticed no shortage of film and television production companies to establish a base of operations in Iceland. Perhaps you caught The Secret Life of Walter Mitty (2013), starring and directed by Ben Stiller? The second half of the movie relocates the action to Iceland; filming took place all across the country. Perhaps you spotted Iceland doubling as some more fantastic location? If you’ve seen Ridley Scott’s Prometheus (2012), or Thor: The Dark World (2013), or Star Wars: The Force Awakens (2015) or Rogue One (2017), then you’ve glimpsed some of its spectacular landscapes and other natural features. And let’s not even start discussing the HBO series Game of Thrones, in which Iceland serves as a darkly beautiful backdrop for the conflicts between wildlings and white walkers North of the Wall. But what of Icelandic literature? How has it fared during this period? All things considered, it’s enjoying rude health, and its vigour, like that of the film and television industry, is also due partly to the response to the events of 2008. In 2011, the Icelandic capital of Reykjavík was officially designated as the fifth UNESCO City of Literature after Edinburgh, Melbourne, Iowa City, and Dublin. That same year, Iceland was officially welcome as the Guest of Honour at the Frankfurt International Book Fair, the largest literary event in the world. These two distinctions coincided with the country’s first year of positive economic growth following the financial crisis, and were bolstered by further, specifically literary efforts to interest the world at large in the culture of Iceland. Leading the charge on these efforts — somewhat improbably — was AmazonCrossing, the translation imprint of the publishing branch of Jeff Bezos’ retail behemoth. Although AmazonCrossing is today the world’s largest single publisher of literature in translation, an enterprise that commissions English translations of books from scores of countries, it was at that time only a start-up venture. Its first crop of books, which it announced at the Frankfurt Book Fair and began publishing in 2012, were translations of ten titles by six authors from Iceland. From a certain perspective, that’s actually not very impressive. Anyone familiar with Icelandic literary culture would surely be inclined to look at those numbers and say, “What? Only six?” There were so many more books for AmazonCrossing to choose from, so many more writers it could have supported. Precise statistics are hard to come by, but the figures look something like this. Iceland has a population of about 350,000 people, and globally about 360,000 people speak the language. Yet, year after year for at least the last decade, publishers have released an annual average of about 1,500 books in Iceland, more than 1,000 of which are written in Icelandic. This means that published authors make up an incredible proportion of the Icelandic population. 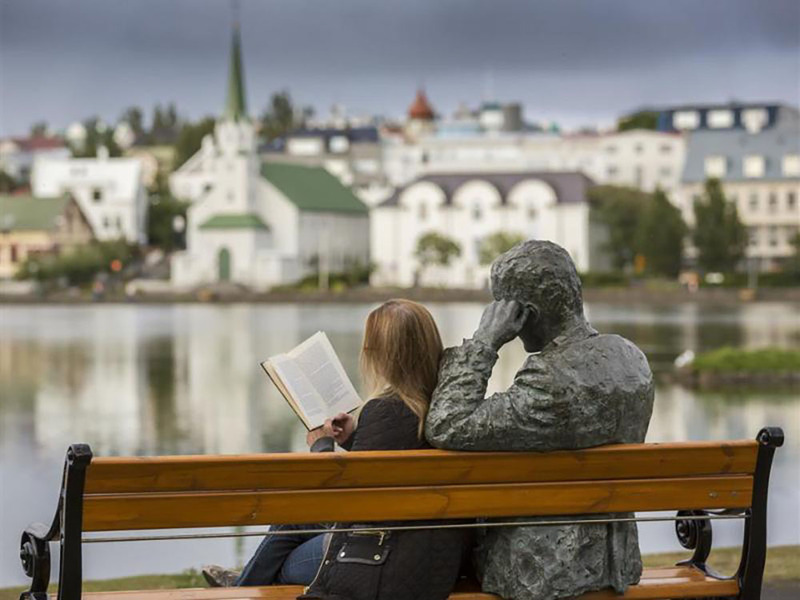 A conservative estimate, based on a figure of 10,000 original books over the last ten years, would suggest that about 3% of all the people living in Iceland have written and published a book. The Iceland Review concurs with this estimate, calculating that 0.3% of the population publishes a book each year, although the BBC has estimated that the figure could be as high as 10%. There’s arguably a big enough market to support a disproportionately large native publishing industry. 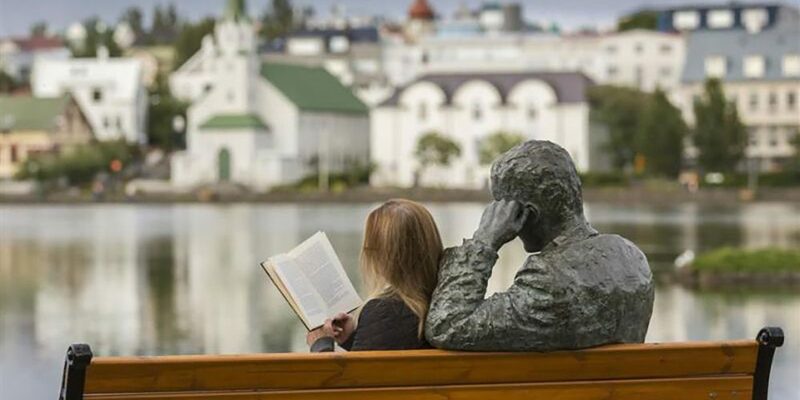 “On average”, according to the Iceland Review, “every Icelander buys eight books per year” and 93% of Icelanders say that they read at least one book per year — a far higher percentage than in many other countries. The ‘Christmas Book Flood’ (Jólabókaflóð) is a huge cultural event: in many families, it’s traditional to exchange books as gifts on Christmas Eve and then spend the rest of the night reading them, and the sales in advance of Christmas can be enormously remunerative for booksellers, publishers, and authors alike. Impressively, official statistical tallies have found that Iceland annually publishes one new title for every 200 citizens — double the scale of publication in the Anglophone world. And yet how many Icelandic writers can you name without Googling? If you pay attention to international contemporary literature, you’ve probably heard of Sigurjón Birgir Sigurðsson, the former lyricist for the singer Björk who now writes books under the pen name Sjón. His two most recent books to be translated into English, From the Mouth of the Whale (trans. Victoria Cribb, 2008) and Moonstone: The Boy Who Never Was (trans. Victoria Cribb, 2016), were both shortlisted for the International Dublin Literary Award (formerly the IMPAC). If you know something of literary history, you might also be aware of Halldór Laxness, Iceland’s only Nobel Laureate in Literature. He won international regard for novels like Independent People (1945) and Under the Glacier (1972), the latter of which was praised by Susan Sontag as “wildly original, morose, uproarious… a marvelous novel about the most ambitious questions”. But there are lots of other Icelandic writers, working in lots of different modes, whose books are as impressive and energetic as the books of these two titans. Unfortunately, it’s difficult to find critical coverage of Icelandic literature in a dedicated space, even where you might expect to find it. Asymptote, the international journal of world literature in translation, has precious little Icelandic content: an extract from Laxness’ Wayward Heroes and a brief discussion of the Icelandic sagas. Three Percent, the online extension of Open Letter Books, has given due consideration to recent books like From the Mouth of the Whale and Moonstone and Guðbergur Bergsson’s Tómas Jónsson, Bestseller, but still the vast majority of its Icelandic content dates from the heyday of the Frankfurt Book Fair. Bright spots appear occasionally online — see, for example, Veronica Scott Esposito’s illuminating interview with the translator Lytton Smith, upon publication of Guðbergur’s modern classic — but on the whole it’s not easy to keep up with Icelandic literature making its way into English. This situation has nothing to do with a lapse in the efforts of translators. While the commissioning of translations is not as centralised as it used to be, given that AmazonCrossing has scaled back its focus on literature from Iceland, Anglophone readers still have a good number of Icelandic books made available to them on a regular basis. The year ahead looks especially promising, with no fewer than five Icelandic novels to be published before the summer, and what’s more is that these novels represent a cross-section of the real variety of contemporary Icelandic literature. There’s more fabulism from Sjón, of course, but there’s also the melancholy domestic realism of Auður Ava Ólafsdóttir, the startling naturalism of Ófeigur Sigurðsson, the complex family sagas of Jón Kalman Stefánsson, and the playful metafiction of Bragi Ólafsson. My feeling is that 2018 looks set to be the most varied year for Icelandic literature in translation since the high water mark of 2012. My feeling is also that this year’s releases deserve coverage in one place, to put them into conversation with one another and offer a clearer illustration of what the wider field of Icelandic literature is capable of today.